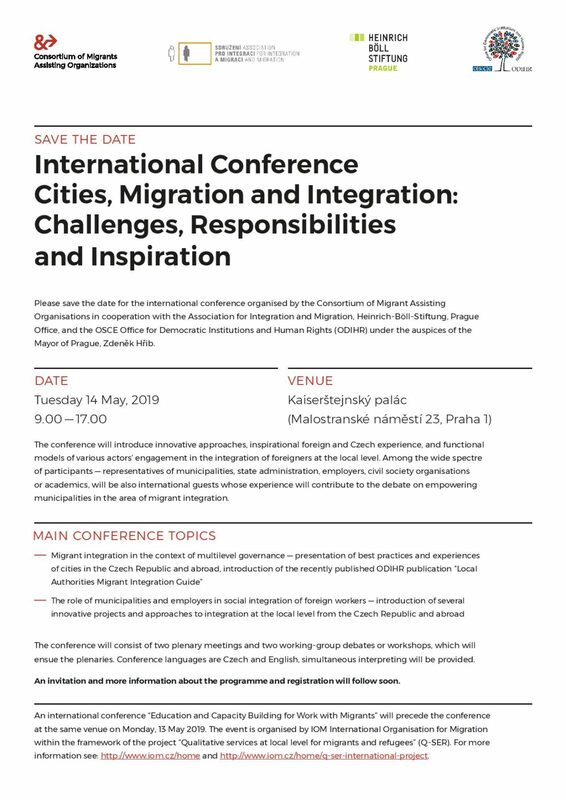 The conference will introduce innovative approaches, inspirational foreign and Czech experience, and functional models of various actors’ engagement in the integration of foreigners at the local level. Among the wide spectre of participants – representatives of municipalities, state administration, employers, civil society organisations or academics, will be also international guests whose experience will contribute to the debate on empowering municipalities in the area of migrant integration. The conference will consist of two plenary meetings and two working-group debates or workshops, which will ensue the plenaries. Conference languages are Czech and English, simultaneous interpreting will be provided. An international conference “Education and Capacity Building for Work with Migrants” will precede the conference at the same venue on Monday, 13 May 2019. The event is organised by IOM International Organisation for Migration within the framework of the project “Qualitative services at local level for migrants and refugees” (Q-SER). For more information see www.iom.cz a www.q-ser.org.